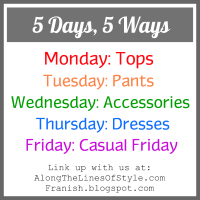 Today for 5 Days 5 Ways, I wanted to showcase my favorite pair of dress pants. You know, the ones I refer to ALL OF THE TIME. They're my "faux dress pants" from NY & Co. I love them because they feel like yoga pants, but they are dressy enough for school. What are your "go-to" pants? I wish I could wear my favorite skinny jeans every day, but unfortunately, that wouldn't go over so well at work :) So I've had to learn to adapt and try new things. That's also why I love challenges like this one because it asks me to reinvent the way I look at my wardrobe. Love it.